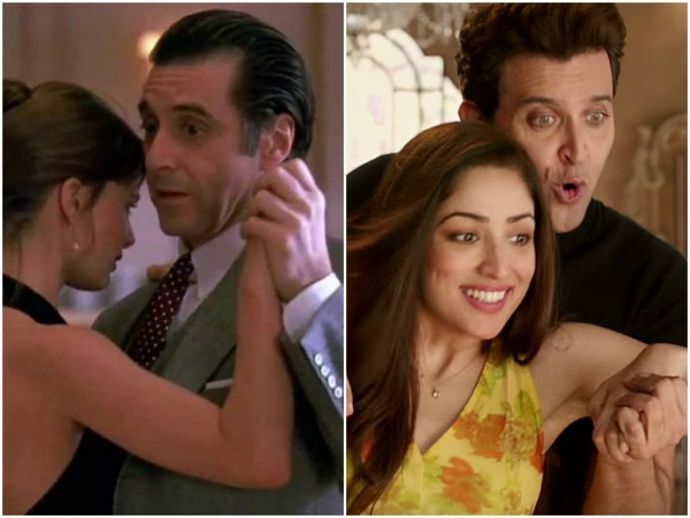 Did Hrithik Roshan In Kaabil's 'Mon Amour' Remind Anybody Else Of Al Pacino? The song has Hrithik Roshan and Yami Gautam, who play a blind couple, dancing to a peppy track. A song from the Hrithik Roshan- Yami Gautam starrer Kaabil was released yesterday. Called "Mon Amour", the Rajesh Roshan composition is a peppy track with a Latino vibe to it, and has the lead actors dancing away, not letting their blindness be a barrier to their fun. While we enjoyed watching Hrithik do what he does best after a long time, this video had strong echoes of another, similar dance routine. Scent of a Woman, a 1992 film starring acting god Al Pacino, has some of his most memorable scenes and lines. Pacino plays Lt Col Frank Slade, a retired Army Ranger who has been blind for a while. In one of the movie's most famous scenes, he invites a young woman (Gabrielle Anwar) to do the tango with him, and in spite of his handicap, leads the lady in a spectacular duet. And if you notice, the similarity doesn't end with the common character point of blindness and the dance. Hrithik Roshan's very expression appears like a tip of the hat to Pacino's countenance in this scene.